Ellen MacArthur Foundation's new study describes the benefits and vision of the circular economy for food. The study was supported by the Finnish Innovation Fund Sitra and many others. Few things are as interwoven with human existence and culture as food. At the most basic level, we need it to survive. Beyond sustenance, food can bring joy and takes a central place in cultures around the world, often as the centrepiece of celebrations and festivities. The current food system has supported a fast-growing population and fuelled economic development and urbanisation. Yet, these productivity gains have come at a cost, and the model is no longer fit to meet longer term needs. Shifting to a circular economy for food presents an attractive model with huge economic, health, and environmental benefits across the food value chain and society more broadly. There are well-known drawbacks related to our consumption of food, including the twin scourges of malnutrition and obesity. Less wellknown is the extent of the negative impacts of current food production methods. Overall, for every dollar spent on food, society pays two dollars in health, environmental, and economic costs. Half these costs – totalling USD 5.7 trillion each year globally – are due to the way food is produced. These USD 5.7 trillion costs are a direct result of the ‘linear’ nature of modern food production, which extracts finite resources, is wasteful and polluting, and harms natural systems. Currently, the agrifood industry is responsible for almost a quarter of greenhouse gas emissions globally, degrades the natural resources on which it depends, and pollutes air, water, and soil. The equivalent of six garbage trucks of edible food is lost or wasted every second. In cities, less than 2% of the valuable biological nutrients in food by-products and organic waste (excluding manure) is composted or otherwise valorised. Perhaps most surprisingly, even when apparently making healthy food choices, people’s health is still being harmed by the way we produce food and deal with its by-products. By 2050, around 5 million lives a year – twice as many as the current obesity toll – could be lost as a result of current food production processes. Among the harmful impacts of such methods are diseases caused by air pollution and water contamination, health consequences of pesticide use, and increased antimicrobial resistance. Some of the principal causes are overuse of fertilisers, excessive reliance on antibiotics in animals, and untreated human waste. The report offers a vision for a healthy food system fit for the 21st century and beyond, underpinned by the circular economy principles of designing out waste and pollution, keeping products and materials in use, and regenerating natural systems. In this vision, food production improves rather than degrades the environment, and all people have access to healthy and nutritious food. While far from the current reality, we believe this vision is completely achievable. After all, food comes from natural systems in which organisms have thrived for billions of years and, when they reach the end of their life, become food for new cycles to begin. Cities have a unique opportunity to spark a transformation towards a circular economy for food, given that 80% of all food is expected to be consumed in cities by 2050. The report focuses on the ability of urban food actors to catalyse this change by getting more value out of their food, and substantially influencing which food is produced and how. The ambitions presented are intended to complement the range of valuable ongoing initiatives that together aim to shift the food system onto a better trajectory. Work conducted with four focus cities (Brussels, Belgium; Guelph, Canada; Porto, Portugal; São Paulo, Brazil) during the development of the report suggests cities have a major opportunity to apply these ambitions, regardless of their unique physical, demographic, and socio-economic profiles. 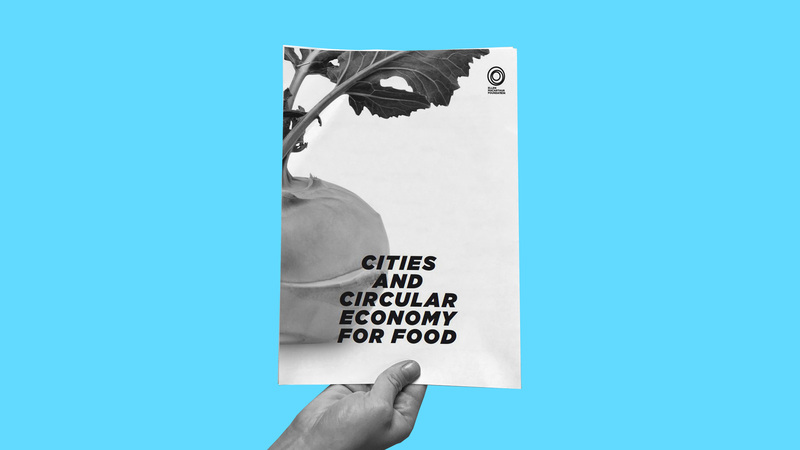 By shifting towards a circular economy for food, cities can help realise the vision and generate significant environmental, economic, and health benefits within and beyond their boundaries. Since 80% of food will be consumed in cities by 2050, cities can significantly influence the way food is grown, particularly by interacting with producers in their peri-urban and rural surroundings. Regenerative approaches to food production will ensure the food that enters cities is cultivated in a way that enhances rather than degrades the environment, as well as creating many other systemic benefits. In the report, regenerative food production is considered in a broad sense as encompassing any production techniques that improve the overall health of the local ecosystem. Examples of regenerative practices include shifting from synthetic to organic fertilisers, employing crop rotation, and using greater crop variation to promote biodiversity. Farming types such as agroecology, rotational grazing, agroforestry, conservation agriculture, and permaculture all fall under this definition. Regenerative practices support the development of healthy soils, which can result in foods with improved taste and micronutrient content. Cites cannot of course implement these techniques alone. Collaborating with farmers, and rewarding them for adopting these beneficial approaches, will be essential. In parallel, cities can use circular urban farming systems, such as those that combine indoor aquaculture with hydroponic vegetable production in local loops. The feasibility and benefits of increasing local sourcing have been the subject of intense debate. While urban farming can provide cities with some vegetables and fruits, it is currently limited in its ability to satisfy people’s broader nutritional needs. However, cities can source substantial amounts of food from their periurban areas (defined in the report as the area within 20 km of cities), which already hold 40% of the world’s cropland. While local sourcing is not a silver bullet, reconnecting cities with their local food production supports the development of a distributed and regenerative agricultural system. It allows cities to increase the resilience of their food supply by relying on a more diverse range of suppliers (local and global), and supporting native crop varieties. It ofers city dwellers the opportunity to strengthen their connection with food and the farmers who grow it, often increasing the likelihood that people will demand food grown using regenerative practices that benefit the local environment and their own health. Local sourcing can also reduce the need for excess packaging and shorten distribution supply chains. Cities can play an important role in sparking a shift to a fundamentally different food system in which we move beyond simply reducing avoidable food waste to designing out the concept of ‘waste’ altogether. As the place where most food eventually ends up, cities can ensure inevitable by-products are used at their highest value, transforming them into new products ranging from organic fertilisers and biomaterials to medicine and bioenergy. Rather than a final destination for food, cities can become centres where food by-products are transformed into a broad array of valuable materials, driving new revenue streams in a thriving bioeconomy. In a circular economy, food products are designed not only to be healthy from a nutritional standpoint, but also in the way that they are produced. From breakfast cereals to takeaway meals, a significant proportion of food eaten today has been designed in some way by food brands, retailers, restaurants, schools, hospitals, and other providers. These organisations have shaped our food preferences and habits for decades, particularly in cities, and can now help reorient them to support regenerative food systems. One example is for food designers to innovate new plantbased protein options as alternatives to meat and dairy, and encourage consumers towards them. Designers can also develop products and recipes that use food by-products as ingredients, and that can – for example by avoiding certain additives – be safely returned to the soil or valorised in the wider bioeconomy. In this way food designers can play their part in designing out food waste. Marketing can position these delicious and healthy products as easy and accessible choices for people on a daily basis. The three ambitions will have greatest impact if pursued simultaneously. Designing and marketing food products that appeal to people using more locally available and seasonal ingredients would increase cities’ connection with local farmers and could help spark the transition to regenerative practices. Using more local ingredients would likely increase the traceability of food and therefore potentially its safety. Similarly, making the compost and fertilisers derived from food by-products attractive to peri-urban farmers would help drive efforts in cities to collect and make the most of these by-products and other organic materials. As hubs of innovation and connectivity, cities are ideally placed to successfully link up all elements of the food value chain. Achieving these three ambitions would allow cities to move from passive consumers to active catalysts of change, and generate annual benefits worth USD 2.7 trillion by 2050 that can be enjoyed by people around the world. These benefits include reducing annual greenhouse gas emissions by 4.3 billion tonnes of CO2 equivalent, comparable to taking nearly all the 1 billion cars in the world of the road permanently; avoiding the degradation of 15 million hectares of arable land per year; and saving 450 trillion litres of fresh water. Health benefits include lowering the health costs associated with pesticide use by USD 550 billion, as well as significant reductions of antimicrobial resistance, air pollution, water contamination, and foodborne diseases. Cities can also unlock an economic opportunity upwards of USD 700 billion by reducing edible food waste and using nitrogen and phosphorus from food by-products and organic materials for new cycles. From producers and brands to processors and retailers, businesses across the food value chain can tap into high-growth sectors such as biomaterials or delicious plantbased protein products.